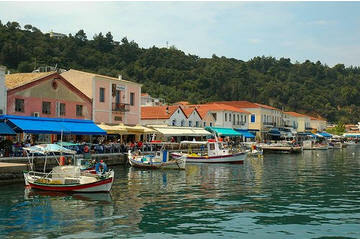 Katakolon is a Seaside Town Port in Ellis, in Western Peloponnisos close to Pyrgos in Greece your gateway to Olympia. Find some local Accommodation Katakolon. On the west coast of the Peloponnese, close to Pyrgos, this small port was originally developed in the mid 19th century for the currant trade. Katakolon is a seaside town in western llia in the municipality of Pyrgos. The town centre is within a gulf overlooking the lonian Sea. 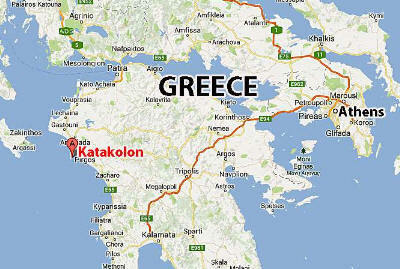 Katakolon is situated on a peninsula and has a lighthouse found in the southwest. The Lighthouse of Katakolon was first opened in 1865 and the town has a population of 612 inhabitant. Katakolon is your gateway to Olympia, where the ancient Greeks flocked every four years for more than a millennium to celebrate the sacred games dedicated to Zeus. Visit the ruins of the Sanctuary, with its athletic quadrangles, stadium, temples and treasures; then browse in the modern Archaeological Museum, a treasure house of Archaic, Classical and Roman sculptures, including the famous Niki Winged Victory. You′ll never fall into the tourist traps when you travel with Frommer′s. It′s like having a friend show you around, taking you to the places locals like best. Our expert authors have already gone everywhere you might go—they′ve done the legwork for you, and they′re not afraid to tell it like it is, saving you time and money. No other series offers candid reviews of so many hotels and restaurants accommodation in all price ranges. Every Frommer′s Travel Guide is up–to–date, with exact prices for everything, dozens of color maps, and exciting coverage of sports, shopping, and nightlife. You′d be lost without us! This guide is specifically geared to travelers who want to go to Greece for beaches, beautiful weather, and island–hopping. Its centerpiece is a feature no other guide offers: a full chapter on cruises, written by one of the cruise industry′s leading specialists and featuring candid reviews of each line and tips on how to get the best deals. We′ll start you off with a quick overview of Athens, your gateway, before setting off to explore the most beautiful and appealing of Greece′s many islands, including the Saronic Gulf Islands, Crete, the Cyclades, the Dodeconese, the Northeastern Aegean Islands, the Sporades, and the Ionian Islands. If you′re exploring on your own, you′ll rely on us for dozens of detailed island and town maps, complete details on ferries and flights, and a wealth of information on accommodations, sightseeing, dining, and nightlife. This is the only guide you need to discover the best of the legendary Greek Isles! OLYMPIA – The site of the first Olympic Games back in 776BC and today a UNESCO World Heritage site. 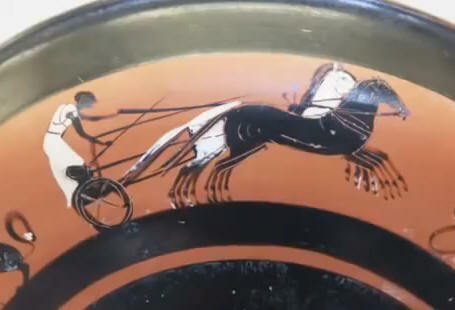 Olympia has cultivated ideals since ancient times. It was never just the games but also the honour, the peace, the struggle and the body – all in one. Visiting the archaeological site and museum, you will walk in one of the most important sanctuaries of ancient Greece. Situated in the landscape of Elis, by the foot of Mr. Kronion, Olympia invites you to take part of the history of Greece. Olympia was the site of the ancient Olympic Games, which were celebrated every four years by the Greeks. Olympia was situated in a valley in Ellis, in Western Peloponnisos. (Peloponnesus), through which runs the Alpheus River. It was not a town, but only a sanctuary with buildings associated with games and the worship of the gods. Olympia was a national shrine of the Greeks and contained many treasures of Greek art, such as temples, monuments, altars, theatres, statues, and votive offerings of brass and marble. The Altis, or sacred precinct, enclosed a level space about 200 m (about 660ft) long by nearly 177 m (nearly 580 ft) broad. In this were the chief centres of religious worship, the votive buildings, and buildings associated with the administration of the games. The French began excavations here in 1829. German explorations of 1875-81 threw much light upon the plans of the buildings; they were resumed in 1936, 1952 and 1960-61. Many valuable objects were discovered, the most important of which was a statue of Hermes, the messenger of the gods, by Praxiteles. 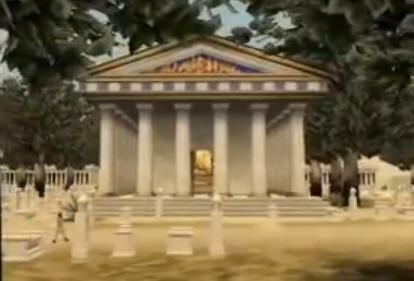 The most celebrated temple was the Temple of Zeus, dedicated to the father of the gods. In this temple was a statue of Zeus made of Ivory and gold, the masterpiece of the Athenian sculptor Phidias. Next to the Temple of Zeus ranked the Heraeum, dedicated to Hera, the wife of Zeus. In this temple, probably the oldest Doric building known, stood the table on which were placed the garlands prepared for the victors in the games. The votive buildings included a row of 12 treasure houses and the Philippeum, a circular lonic building dedicated by Philip II, King of Macadeonia, to himself. Outside the Altis, to the east, were the Stadium and the Hippodrome, where the contests took place; on the west were the Palaestra, or wrestling school, and the Gymnasim, where all competitors were obliged to train for at least one month. The Archaeological Museum of Olympia, one of the most important museums in Greece, presents the long history of the most celebrated sanctuary of antiquity, the sanctuary of Zeus, father of both gods and men, where the Olympic games were born. The museum’s permanent exhibition contains finds from the excavations in the sacred precinct of the Altis dating from prehistoric times to the Early Christian period. Among the many precious exhibits the sculpture collection, for which the museum is most famous, the bronze collection, the richest collection of its type in the world, and the large terracottas collection, are especially noteworthy. The Archaeological Museum of Olympia – Greece. The Archaeological Museum of Olympia (SEP 2013) is one of the great museums of Greece in Olympia, Elis, and houses artifacts found in the archaeological site of Ancient Olympia. The museum was built opposite the excavation site in a valley northwest of the Kronion hill. Designed by Patroklos Karantinos, it was officially opened in 1982. One of the best known exhibits is the Nike of Paeonius, which is featured on the medals awarded during the 2004 Summer Olympics in Athens. The museum building comprises exhibition rooms, auxiliary spaces and storerooms. The vestibule and twlve exhibition rooms contain objects excavated in the altis. The auxiliary spaces (lavatories) are located in the museum’s east wing; a separate building between the museum and the archaeological site houses a book and souvenir shop. Finally part of the east wing and the basement are dedicated to storage and conservation of terracottas, bronze stone, mosaics and minor objects. Take A Break Holidays takeabreakholidays, Katakolon Accommodation.